This stunning White sapphire Engagement Ring is intricately crafted by hand.This White sapphire Engagement Ring was set into 14k shimmering White Gold. The ring was completely handmade by Sumuduni Gems, using fine detailed handcrafting halo which is seen before your eyes In order to complement the setting. Very beautiful and delicate – this ring is so feminine. The color is gorgeous -, not icy. Tones of sparkles! 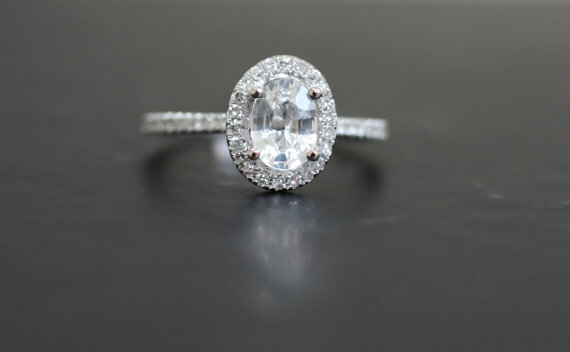 white gold diamond setting works perfectly to highlight the beauty of the center stone. 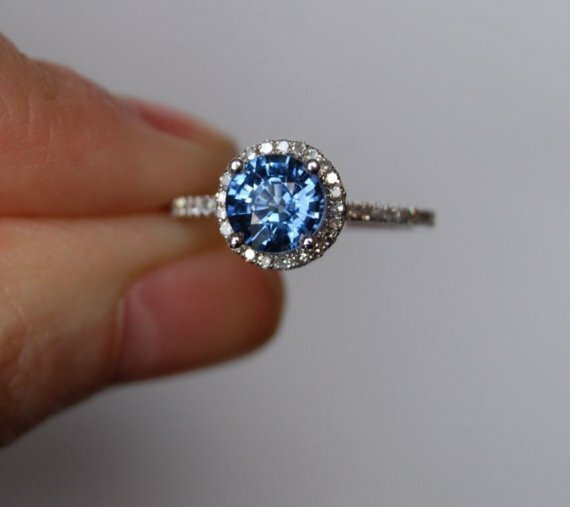 The sapphire is untreated, VS, 1ct. Diamonds are SI/I-J, TDW approx. 0.2ct. 14k White gold. 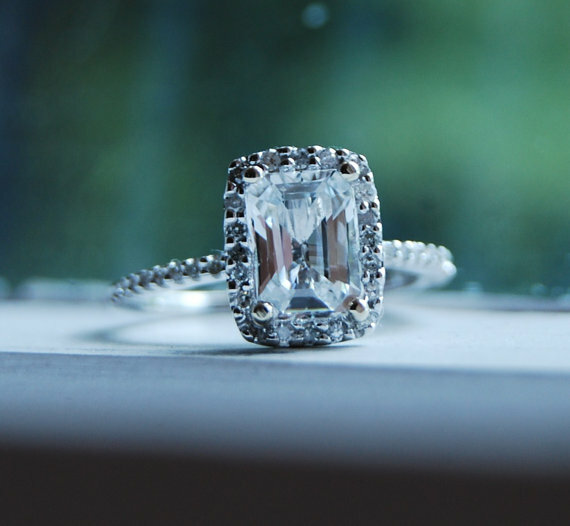 The Emerald cut is a combination of classic sparkle with modern shape. It’s sparkle is universally adored by the precise square cuts of the Emerald facets. This ring is handmade to perfection, by our master jewelers who hand select all of our conflict-free diamonds in order to provide the perfect matching ones for your setting.This ring feature 2 carat emerald cut White Sapphire as center Stone. 04. 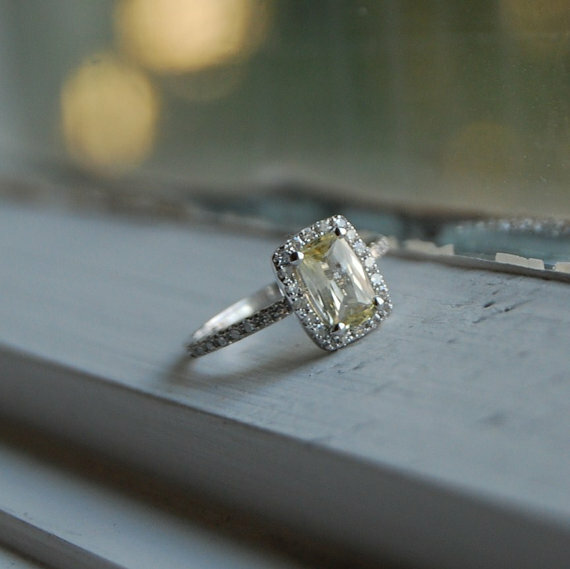 Cushion Cut Champagne Yellow Sapphire Halo Engagement Ring 14 K white Gold $1699. This ring will definitely steal her heart  for sure .this beauty feature 1 carat Ceylon Natural peach sapphire over 1 carat.perfect match with rose gold diamond setting . This stone has pretty unique very hard to find and rare stone .. The color is gorgeous -, not icy. Tones of sparkles! she `ll love the ring! 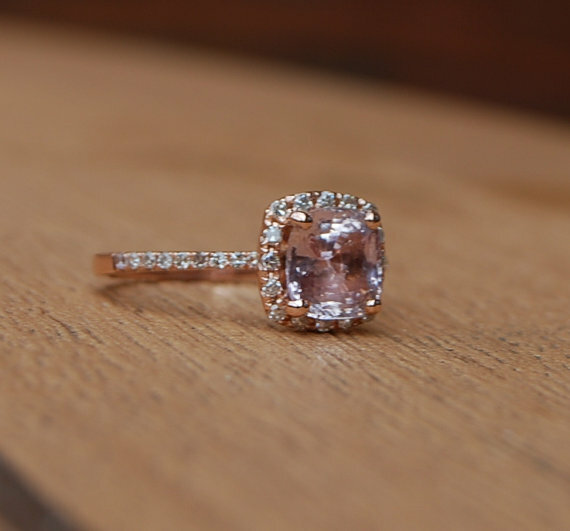 The Stunning simplicity a Cushion Cut Peach Sapphire Engagement Ring Has is unmatched. Designed with perfect proportions and a refined setting that lifts the Sapphire up to the light, allowing magnificent sparkle and glistening to occur whenever worn. Timelessly elegant, this 1.7mm white Rose Gold ring has been meticulously designed and crafted with a four-prong-set Cushion -cut solitaire. This 1 carat Peach Sapphire was hand selected by Suranga Neranjan .this Peach Sapphire Engagement Ring will be sure to catch everyone’s eye! One 14k white gold beautiful handmade ring set with a 20ct top quality White Sapphire of Eye Clean .A perfect symbol of love for you to give to your beloved. Set in strong 14k white gold in order to provide her with the most security so that she may wear it everyday worry free! 08 . 01 carat yellow sapphire rose gold engagement ring round halo sapphire ring. 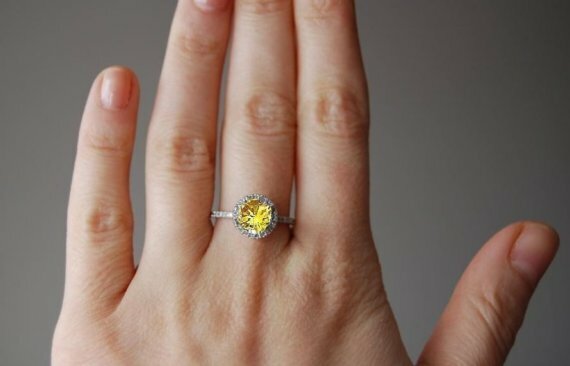 This yellow sapphire round halo engagement ring will definitely steal her heart  for sure .this beauty feature 1 carat Ceylon Natural yellow sapphire over 1 carat.perfect match with white gold diamond setting . 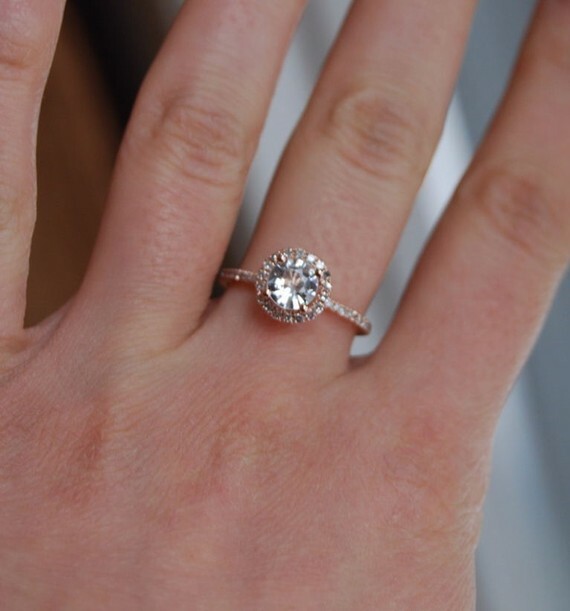 This is a beautiful petite handmade 1 carat halo White Sapphire engagement ring, using solid 14k Rose gold and the traditional 4-prong setting. A traditional and simple look perfected for you to give your beloved. 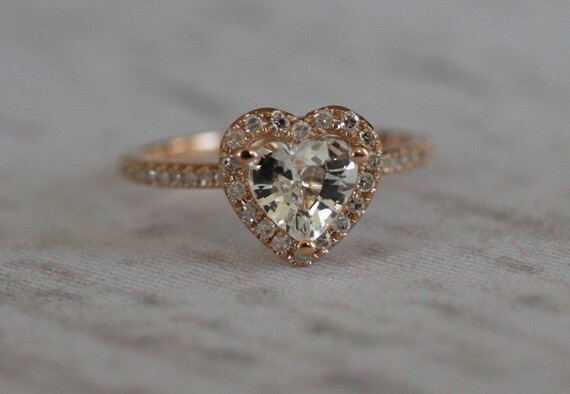 This beautiful heart shape ring feature 1 carat white sapphire .it is so feminine . 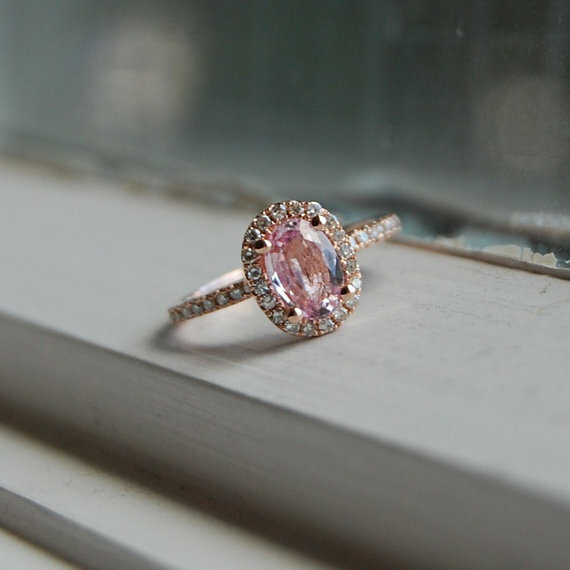 Rose gold diamond setting works perfectly to highlight the beauty of the center stone. This entry was posted in Gem Education|Sumuduni Gems, Sapphire engagement rings. Bookmark the permalink.